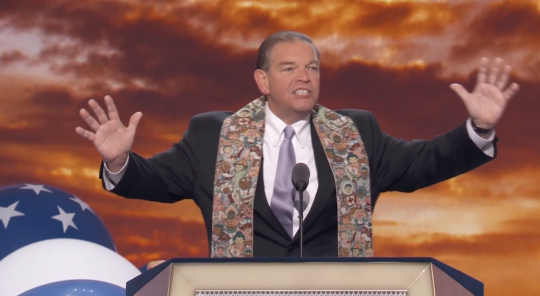 Hillary Clinton's longtime pastor plagiarized portions of his new book, Strong for a Moment Like This: The Daily Devotions of Hillary Rodham Clinton. Clinton and Rev. Bill Shillady, an ordained minister of the United Methodist Church, first met in 2002. Shillady formed a bond with Clinton, serving as the officiant at her daughter Chelsea Clinton's wedding and presiding over her mother's funeral. Clinton even wrote the preface to Shillady's book, based on a series of letters he sent her during the 2016 election. One letter in particular caused controversy for seemingly comparing Clinton's loss to the crucifixion of Jesus Christ. But after that story went viral, another pastor, Matthew Deuel, contacted CNN and pointed out similarities between Shillady's book and a blog post he wrote months earlier. Both Duel's blog post and Shillady's book contained the following paragraph: "For the disciples and Christ followers in the first century, Good Friday represented the day that everything fell apart. All was lost. The momentum and hope of a man, claiming to be the Son of God, the Messiah who was supposed to change everything, had been executed. Duwel wrote, "Death will be shattered. Hope will be restored. Redemption is coming. But first, we must live through the darkness and seeming hopelessness of Friday." Shillady's book contained the exact same paragraph, without the sentence about redemption. In a statement to CNN, Shillady apologized to Duwel. "In preparing the devotional on the morning of November 9, I was determined to provide comfort with the familiar adage that ‘It's Friday But Sunday is Coming.'" I searched for passages that offered perspective of this theme," he explained. "I am now stunned to realize the similarity between Matt Deuel's blog sermon and my own. Clearly, portions of my devotional that day incorporate his exact words. I apologize to Matt for not giving him the credit he deserves." This entry was posted in Politics and tagged Bill Shillady, Hillary Clinton. Bookmark the permalink.